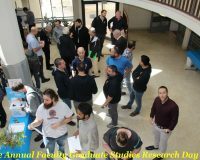 The Annual Graduate Studies Research Day took place on March 27, 2019 at the Faculty of Aerospace Engineering. A Joint Purdue – Technion Course on Aero-Thermal Measurement Techniques took place on March 9-16, 2019. 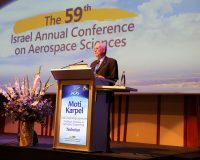 The 59th Israel Annual Conference on Aerospace Sciences (IACAS) was held in Tel Aviv and the Technion on March 6-7, 2019. 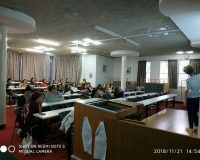 The November 2018 TechWomen event took place yesterday, 21/11/18, where high school female students from 11th and 12th grades arrived to the Technion, heard various lectures and visited the faculties. On November 6th, 2018, a turbomachinery workshop, organized by Asst. Prof. Beni Cukurel, was held at the Technion Faculty of Aerospace Engineering for the sixth consecutive year. 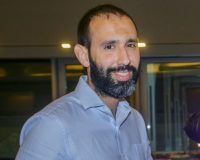 Yaron Ben-Ami, a PhD student under the supervision of Asst. Prof. Avshalom Manela, has become a Fellow of the Israel Academy Adams Program for 2018-2019. Congratulations to the students of the class of 2017 on your B.Sc. 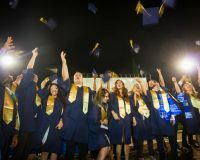 graduation from the Faculty of Aerospace Engineering at the Technion! 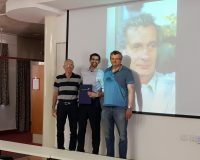 The prize commemorating Prof. Shmuel and Noemi Merhav was awarded to Shimon Julius in a ceremony held today, June 25, 2018. The 2019 Annual Faculty Graduate Studies Research Day: The 2019 Annual Faculty Graduate Studies Research Day will take place on Wednesday, March 27, 2019 between 12:30-14:30. 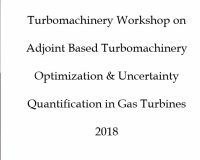 Workshop on Adjoint Based Turbomachinery Optimization and Uncertainty Quantification in Gas Turbines: The two distinguished guest lecturers are Prof. Francesco Montomoli and Prof. Tom Verstraete, from Imperial College of London and Von Karman Institute for Fluid Dynamics respectively. Conclusion and Presentation of the Undergraduate Students' Final Design Projects 2017/18: The event to conclude and present the Undergraduate Students' Final Design Projects for the academic year 2017/18 will take place on Wednesday, June 27, 2018 at the faculty. “Gvahim” Excellence Program Ceremony: Scholarships and certificates for the students of “Gvahim” Excellence Program, for the 2016-2017 academic year. The 5th Annual Professor Singer Memorial Lecture - An Afternoon Talk on Bones, Doctors and High Order Finite Element Methods: Prof. Zohar Yosibash, Head of the Computational Mechanics and Experimental Biomechanics Labs at the School of Mechanical Engineering, Tel Aviv University, will present the lecture. Congratulations to our student Omer Ramon for winning the 2017 Technion running race! The Faculty of Aerospace Engineering congratulates the 2016 recipients of Masters and Doctoral degrees. Advanced courses (086) and graduate courses (088) will now be taught in English for enrolled international students. 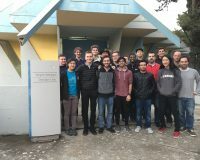 The 5-day Fly-In Technion event: 15 European students, members of the EUROAVIA Association, accompanied by a group of Technion students, visit the Aerospace Engineering Department. On May 25th, 2014 the department welcomed a visit from L. Garde, an innovative company in the field of aerospace.